Monday, September 30, 2013 - 13:19 By Calvin E. Johnson Jr. The United States flag flew at half-mast when Robert E. Lee died! Lee Chapel at Washington and Lee University is the site of annual programs paying tribute to Robert Edward Lee. On Monday, October 14, 2013 a program commemorating the Washington College presidency of Robert E. Lee on the 143rd anniversary of his death will feature War Between the States historian Frank O’Reilly. The lecture entitled "Adapt, Improvise, and Overcome: Robert E. Lee's Greatest Victory at Chancellorsville" will begin at 12:15 p.m.
(Intelligence was received last evening of the death at Lexington, Va., of Gen. Robert E. Lee, the most famous of the officers whose celebrity was gained in the service of the Southern Confederacy during the late terrible rebellion.) ---New York Times, October 13, 1870. October 12th is the 143rd anniversary of the passing of Robert E. Lee whose memory is still dear in the hearts of many people around the world. It’s written that the rains and flooding were the worse of Virginia's history on the day General Lee died.On Wednesday, October 12, 1870, in the presence of his family, Lee quietly passed away. The church bells rang as the sad news passed throughout Washington College, Virginia Military Institute, the town of Lexington and the nation. Cadets from VMI College carried the remains of the old soldier to Lee Chapel where he laid in state. Many buildings and homes were covered in black crepe for mourning. Memorial meetings were held throughout the South and as far North as New York. At Washington College in Lexington eulogies were delivered by: Reverend Pemberton, Reverend W.S. White--Stonewall Jackson’s Pastor and Reverend J. William Jones. Former Confederate President Jefferson Davis brought the eulogy in Richmond, Virginia. Lee was also eulogized in Great Britain. 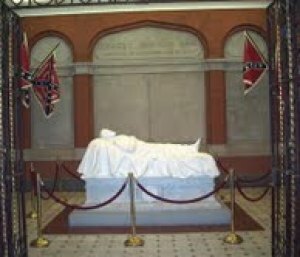 Robert E. Lee’s last words were, "Strike the Tent." He lives in Kennesaw, Georgia, near Atlanta.